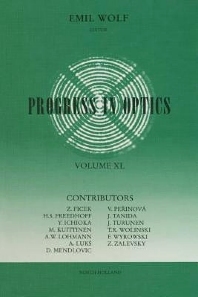 The publication of volume forty of Progress in Optics marks a significant milestone. Volume one was published in 1961, a year after the invention of the laser, an event which triggered a wealth of new and exciting developments. Many of them have been reported in the 234 review articles published in this series since its inception.The present volume contains six review articles on a variety of subjects of current research interests. The first is concerned with polarimetric optical fibers and sensors, and reviews the main efforts and achievements in this field within the last two decades.The second article presents a review of recent researches on digital optical computing. After introducing the basic concepts needed for understanding the developments in this field, some feasibility experiments as well as software studies are discussed.